A new #KH3 trailer ahead of #TGS2018, who would have guessed?
" Just ahead of the Tokyo Game Show event, KINGDOM HEARTS III fans were transported to the futuristic city of San Fransokyo, where the heroic cast of Big Hero 6 joins Sora and his friends in an epic battle against the darkness. Big Hero 6’s story of friendship continues on in KINGDOM HEARTS III, as the super crew of Hiro Hamada, Honey Lemon, Go Go Tomago, Wasabi No-Ginger, Fred and their robot companion Baymax embark on a new adventure together with Sora, Donald and Goofy. It is really hard to believe that Kingdom Hearts 3, a game that I have been waiting years for is just a little over 4 months away. I'm keeping my fingers crossed that there won't be anymore delays. It is also nice to see that they finally showing off the official box art for the game as well. For those of you that are into uncovering secrets Nomura did say that all of the box arts for the HD Remasters have a relation and seeing that this new one is in the same art style I'm guessing that there is also some relation here. Its also nice to see that Roxas makes an appearance in the trailer as well. 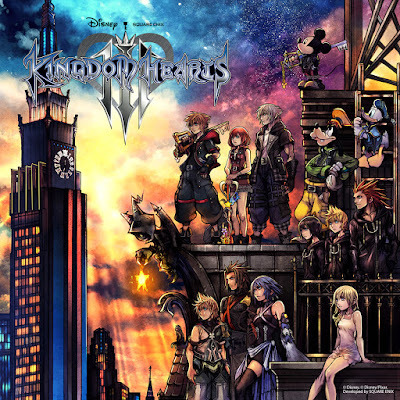 Kingdom Hearts 3 is scheduled to release on January 29, 2019 currently for the Xbox One and Playstation 4.